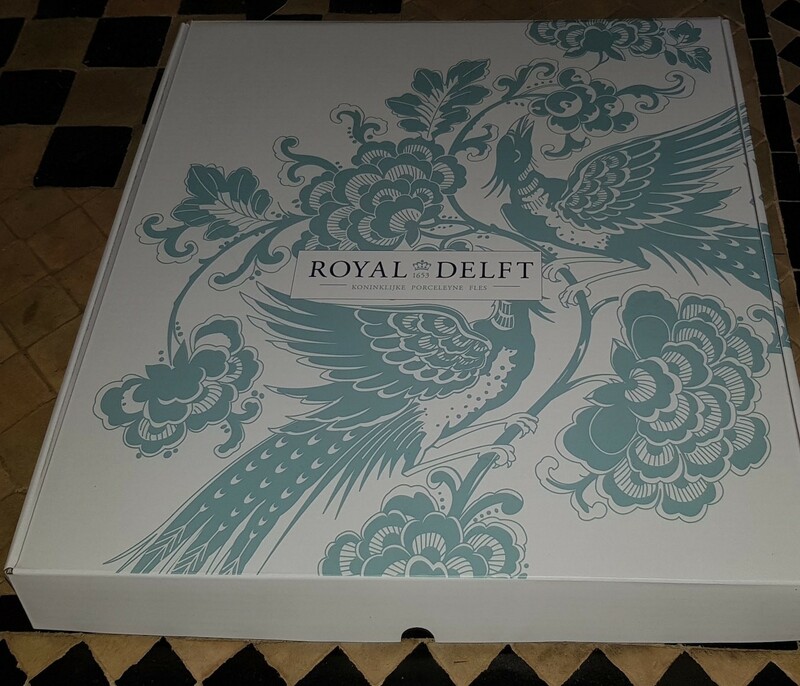 Beautiful gift box for a Diskus Board Royal Delft, specifically designed for that purpose. Made of printed cardboard with a size of 32 x 32 cm. The box is plano, that is, delivered flat with fold seams. The gift box has a beautiful soft blue ornament on the lid and the shape and size of a pizza box, that protects the plate from breaking during transportation! 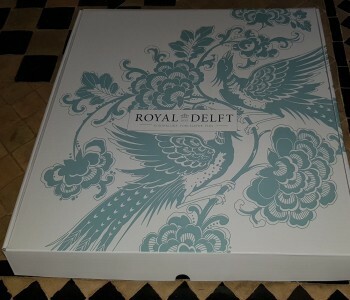 Beautiful gift box for a Diskus Plate, especially designed for this purpose by Royal delft. Made of printed cardboard with a size of 32 x 32 cm. this gift box has a beautiful soft blue ornament on the lid. If you order the gift box, this box is delivered plano, that is, delivered flat with fold seams. The gift box has. The gift box has the shape and size of a pizza box and is very easy to put together. The Hague artist Nicole van Schouwenburg on how it began: "I do calligraphy and I do really like that. Preferably with brush and blue ink. With panache and curls. In 2005 I got the idea: I'm going to paint a plate with a text, which runs from the outside in, so that the text is going to work as decoration. At one point I thought: it looks like Delft blue! 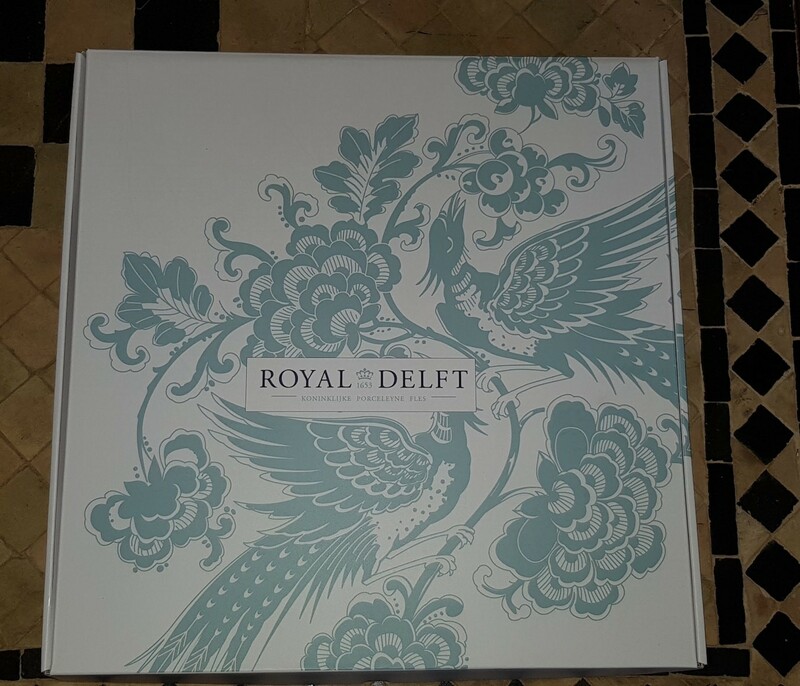 With a trial plate under the arm I stepped to Royal Delft in Delft. There they saw in my plate right away the ability for a good product. We entered in a first series. In the laboratory we tested the best color blue and the best type plate. A fun craft part of the process."